Updated at 7:10 pm, April 30, 2014. Along with the Island Food Pantry, Red Stocking, and free church suppers, a less familiar program in the community safety net assisting those in need is Clothes to Go. A ministry of the United Methodist Church, since 2009 this program has collected donations of new and “gently used” wearables from generous Vineyarders and made them available free to those who need them. Clothes to Go, located in Vineyard Haven’s Stone Church, is open one morning and three afternoons a week in winter, one morning and two afternoons in spring. The schedule coincides with that of the Food Pantry, which operates in an adjoining room, making it one-stop shopping for many. One recent afternoon, regular volunteer Brenda Piland sat at the front table sorting new donations. Wearing a red shirt and aqua fleece vest with dark tights, Ms. Piland looked businesslike and comfortable. “Clothes to go!” she acknowledged with a grin, gesturing at her fashionable outfit. Unlike its earliest days when donations were piled on tables for patrons to browse through, today the room is attractively organized like a consignment shop. Inventory is extensive, garments displayed neatly on shelves and racks. Shelving along the rear wall holds men’s and women’s shoes and boots; children’s items are sorted into cubbies. Slacks, jeans, shirts, sweaters, and jackets hang from freestanding racks. All are in good repair, and many have familiar quality labels. Small bins hold hats and wallets; racks display neckties and belts. There are blankets, household goods, linens, towels, toys, and books. The number of patrons varies. There may be a handful one day, more than two dozen another. But business is brisk and customers leave satisfied, with armloads or bags of useful finds. The $10 or $15 collected in a donation pitcher each week goes into the Trinity Methodist Church Sunday plate. People drop off donations often. That afternoon a woman brought several clean, colorful children’s tee-shirts. While some donors give one or two items, others arrive with boxes or trash bags, stuffed to bursting. This winter, a community member came with a stack of warm blankets, quickly claimed by delighted patrons. Volunteers once received eight bags of clothes from a single donor. Most contributions are in good shape but occasionally some cannot be used. Ms. Piland said that although the racks and shelves are well stocked, turnover is high. A constant supply of replacements is needed. Unlike many second-hand programs, Clothes to Go accepts out-of-season clothing. Thanks to available storage space in the church basement, garments not suited for immediate use are packed in bins to be offered later. 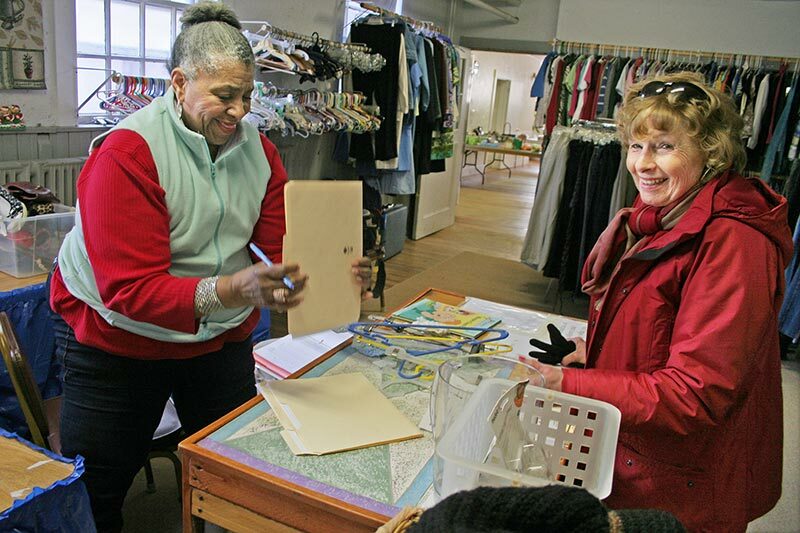 “The Clothes to Go ministry is one of the few places on Martha’s Vineyard where people with financial challenges can go to get clothing free of charge,” said the Rev. Robert Hensley of Grace Episcopal Church. “It is convenient to those who use the food pantry, being housed at the same location. Mr. Hensley is especially aware of local needs as he works closely with the Island Homeless Outreach ministries through the clergy association. Clothes to Go got underway with the support of the Rev. Richard Rego and many other helpers in the congregation. In the beginning it was “like a pop-up,” Ms. Fiore said. Volunteers would unpack donated clothing, laying it out on parish hall tables early Saturday morning. That afternoon they would store the goods to clear the room for Sunday. It quickly became clear that a permanent space was needed where displays could remain set up and patrons could come more often. The program moved to the Stone Church in the spring of 2010. At first volunteers made do with big tables for clothes, but soon they acquired donated racks, shelves, and bins. Murray’s of the Vineyard gave racks and hangers when going out of business. Stores occasionally donate merchandise that hasn’t sold. Churches and schools have had clothing drives. Students volunteer to fulfill community service requirements. And Ms. Fiore reported that recipients sometimes return to donate or help when they are able. Ms. Fiore said she is glad to be next door to the Island Food Pantry to make it easier for patrons, and she has received invaluable support and advice from its director, the Rev. Armen Hanjian. Volunteers staff the facility during operating hours, and a monthly workday is held when volunteers do an overall cleanup, sort donations, pack out-of-season clothing, and other chores. “It’s quick work and it’s fun,” said Ms. Fiore. Ms. Fiore is convinced that this program is needed by many Vineyarders who are just trying to get by. She said it is not just the very poor who need help clothing their families. “I raised my kids here, I know the cost of living,” Ms. Fiore said. “As a full-time social worker I see families every day trying to make ends meet. Ms. Fiore said that occasionally concerns arise about people taking more than their share, or using the program when they don’t really need it. But she remains determined to keep Clothes to Go open to all. There are no eligibility requirements, no application forms, means tests, or references. Clothes to Go spring hours: Mon., Wed. 2 to 4 pm, Sat. 9 to 11 am. Volunteer work days: Saturdays May 17, June 21, 3 to 5 pm. Stone Church, Church St., Vineyard Haven. For info, call 508-693-4424.